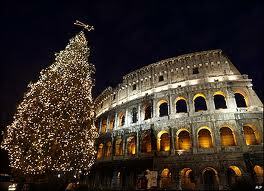 Rome is one of the top Italian city to visit during the Christmas holiday season. The first Christmas mass was at the Church of Santa Maria Maggiore and the earliest known permanent nativity was carved for the Rome Jubilee in 1300. From early December through Epiphany on January 6, Piazza Navona, Rome’s famous Baroque square, is a huge Christmas market! All kinds of Christmas sweets, toys, nativity figures, decorations, and gifts: you can find those here. A large nativity scene is in the square later in December, too. Each year a huge Christmas tree is in Saint Peter’s Square. A life-size nativity is not unveiled until Christmas Eve. Thousands of visitors gather in Saint Peter’s Square when the Pope says midnight mass on Christmas Eve inside Saint Peter’s Basilica and delivers his Christmas message at noon on Christmas Day. The Church of Saints Cosma and Damiano displays one of the largest nativity scenes (open Friday – Sunday except in August, 9:00-1:00 and 3:00-6:00). Charles II of Naples wanted it: you can find not just religious figures but people from everyday life. Six master woodcarvers worked on the scene from 1780 through 1820, adding new figures each year. The city of Rome bought it and restored it in the 1930’s. In the 16th century, a statue was carved from a piece of olive wood from the Garden of Gethsemane. Returning to Rome, the ship sank but the famous statue washed up on shore. It was blessed by the Pope and kept in the Church of Santa Maria Aracoeli on the Colle Capitolinol. In the early 1990’s, the original was unfortunetely robbed and a new piece of olive wood was requested to carve a reproduction. In Rome children use to write their Christmas letters to Santo Bambino. On Christmas Eve the statue is put in the church’s presepe and on January 6. Thousands of people gather for the procession. But is the nativity in Santa Maria Maggiore maybe the oldest presepe or permanent nativity scene, carved in marble by Arnolfo di Cambio in the late 13th century. Below the altar is a reliquary said to containwith apparently some pieces coming from the original manger. Rome has also a large Jewish population and Hanukkah is another important celebration in December. A large Menorrah is set up in Piazza Barberini: only one candle lit up each night during the Hanukkah season. This entry was posted on Friday, December 30th, 2011 at 8:20 pm	and is filed under Events in Italy. You can follow any responses to this entry through the RSS 2.0 feed. You can leave a response, or trackback from your own site.